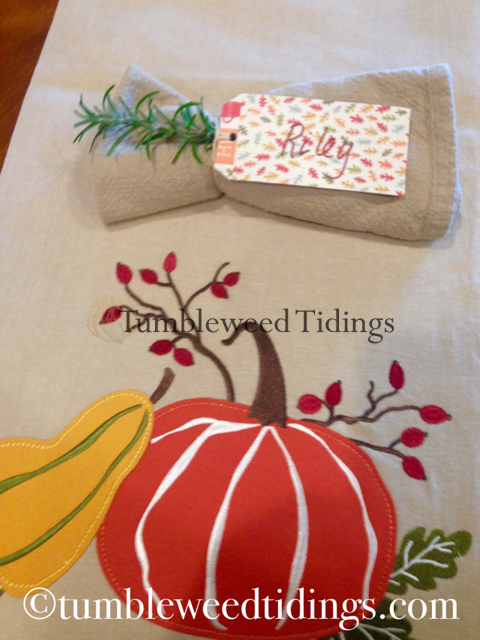 Happy Thanksgiving week from Tumbleweed Tidings! 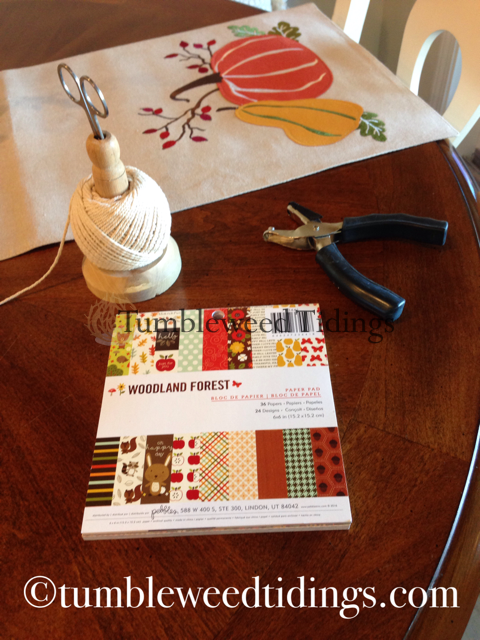 Today, I have a very simple, kindergarten level, DIY to enhance your Thanksgiving table. After years of hosting holiday meals and entertaining family and friends, for a variety of reasons I have found it works out much easier if there is assigned seating. The left-handed people are accommodated, the taller people can have the heads of the table, and the parents who need to help their children can be seated next to them. Once I figure out where everyone will be seated, I typically make place cards to go into a holder, or utilized in some way as part of the napkin ring. In previous years, I have used a Martha Stewart template that became a wrapper for a Hershey bar (that one was a big hit), a set of “getting to know you” cards that had the person’s name on the front and a question on the back that they answered about themselves (that one was actually really fun….I learned things about longtime friends that I had never known), and at Easter a couple of years ago, a bag of Jelly Belly’s tied with a ribbon and their name on it. Before you think I’m overly fancy or that this is a lot of work, it’s not. Especially since I only do this type of sit-down dinner about twice a year… just often enough to keep it fun. Since I haven’t hosted Thanksgiving for a few years, and our Christmas routine is a much more casual buffet affair, this year I thought I’d make something quick and easy for our Thanksgiving table. 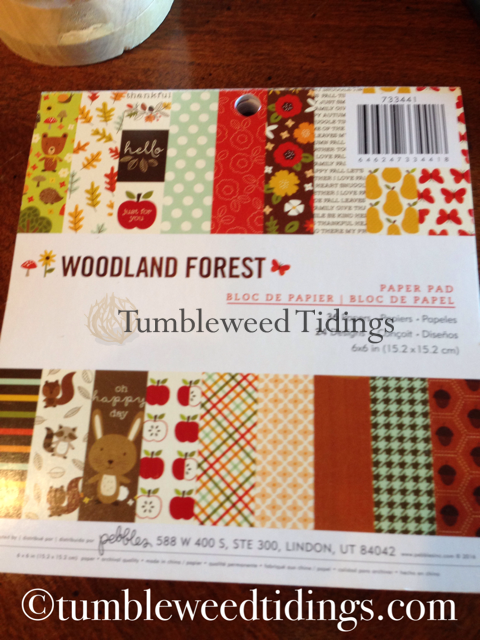 It started with a notepad of scrapbooking paper I found at JoAnn’s that was in a woodland forest theme. 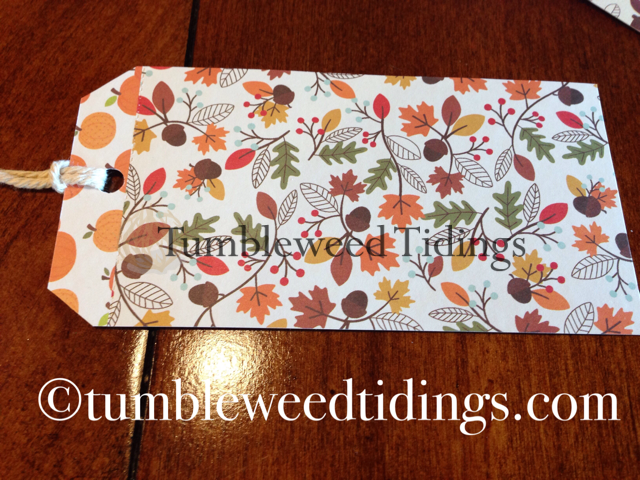 These super cute papers were cut into a tag shape, by clipping off the corners. Then the top was punched with a paper punch, and the tie was made from kitchen twine that was run through the hole. 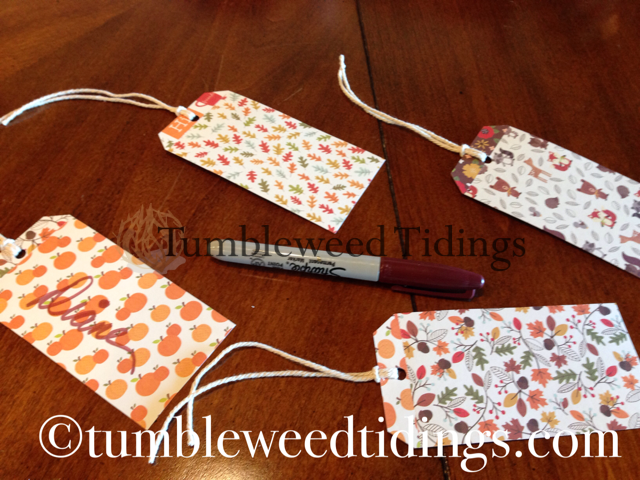 After I made all of the tags, I used a brown Sharpie to write the names on each one. And voila, it was that simple and they were done! 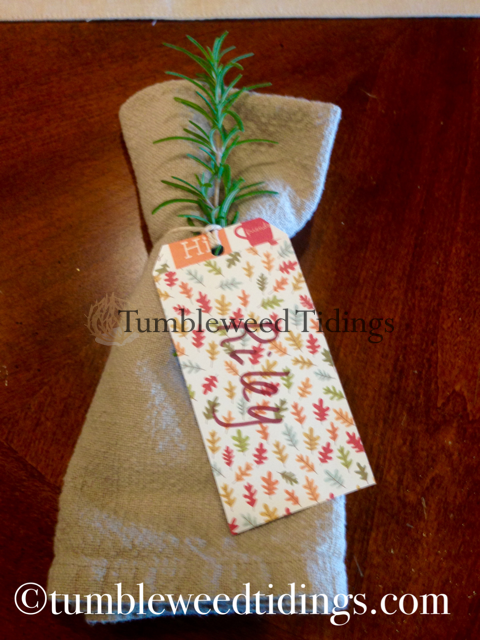 I tied them around my natural colored Pottery Barn napkins that wash up like a dream, and for the final flourish, I added a sprig of rosemary from my herb garden. Sometimes, it is fun to make an event extra special, to make this meal stand out from the rest of the year. It doesn’t take much effort or money to create simple place cards for your next sit-down dinner. Often, they can serve dual purpose and be the napkin rings as well. No matter how you and yours celebrate this Thanksgiving, I wish you a day full of family, fun, and good food. 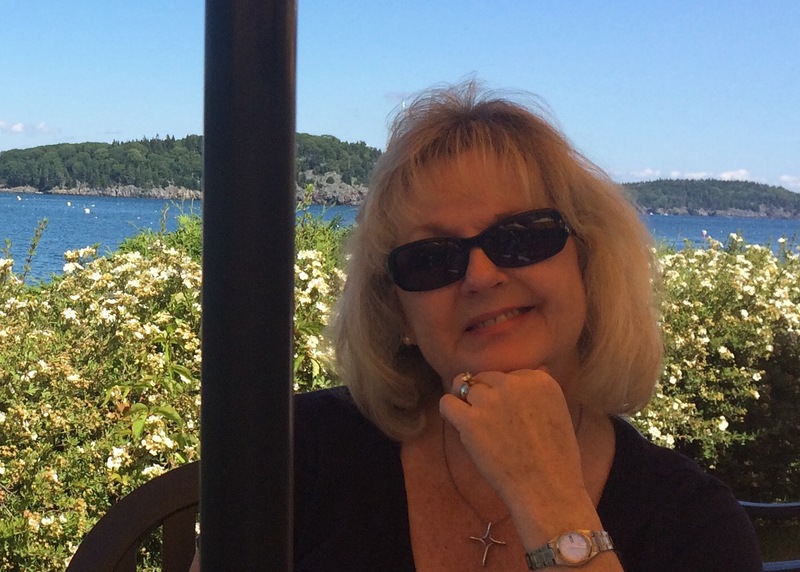 This year, I am grateful for many different things, especially for those of you who follow my blog. These are great ideas. The name tags were so pretty. Yesterday was such a wonderful,fun day. Your dinner was beyond delicious. Oh, I’m glad you liked it! We were all so glad you could be there. It was such a special day with four generations together!